With 3 of the top ten high school football teams in the nation from Texas. And coming in right behind Canada, Australia, and India. Accounts for 1/4th of U.S. refining capacity. Cattle, cotton, hay, sheep, wool, goats, and mohair production. 86% of the state is rural, with 130.4 million acres of farmland. Which is the size of California and Wisconsin in farmland. And while Texas doesn’t have the right to secede, they do have the little known right to break up into as many as 5 separate states (without federal government approval). 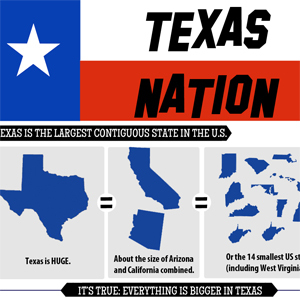 Whatever way you cut it, everything’s bigger in Texas.